While Austin is growing at an alarming rate, there are also large chunks of people who are leaving for other cities because of better career and creative opportunities, lower housing price, remote work trends, etc. 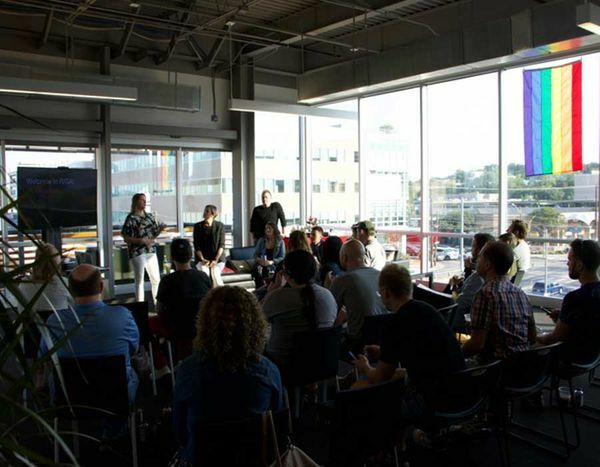 This panel made up of experienced design professionals and policy leaders will hit on actionable solutions the City of Austin can deploy for retaining talent, while also opening doors to those people interested in building their design careers in Austin. How Austin can support becoming the identity of their constituents - be the voice for the people moving here. Prior to R/GA, Candice spent eight years at Modem Media (now part of Publicis Groupe) in a strategy capacity, where she helped to drive client business via digital programs. While at Modem, Candice worked with clients such as Amgen, Wyeth, Sprint, Intel, and Microsoft. Her other experience has included several roles at iCrossing, where she headed up its national healthcare and retail verticals. While there, she served as VP, Managing Director, of its San Francisco office, where she secured new clients such as Cancer Treatment Centers of America, PetSmart, Charles Schwab, and Robert Half International. Candice was also instrumental in the success of record-breaking online sales days for clients such as Williams-Sonoma. Candice holds bachelor’s degrees in chemistry and economics from Bucknell University, and a master’s degree in international management from the Monterey Institute of International Studies. A New Hampshire native, she has quickly adapted to the Austin lifestyle, and enjoys exploring the many outdoor activities the city offers with her husband and daughter. Jim Butler is Manager of Creative Industries Development in the Economic Development Department of the city government of Austin. He has worked on economic development projects since the early 1990’s, first with the Texas Governor’s Office and then with the city government of Austin. His work has focused on improving the economies of Texas and Austin through the development of and collaboration with technology sectors, entertainment sectors, and arts sectors. Oen Michael Hammonds, a designer, mentor and the Head of Design Enablement Experiences at IBM, has designed across the gamut—advertising, graphic, interactive and environmental. Oen's previous work with diverse clients in the consumer, business and technology industries demonstrate his ability to jump in and solve tough challenges. At IBM, Oen leads the Enablement education team to develop education programs and experiences for executives, software development teams and others IBMers. In this role, Oen and his team facilitate workshops that activate participants to effectively apply IBM Design Thinking and modern work practices to build iconic products with human centered experiences. Bijoy Goswami is the founder of the the Bootstrap Network, an organization that brings entrepreneurs from various fields together to share advice about creating and maintaining companies. He is also the author of 'The Human Fabric.' In this book and the Bijoy Goswami keynotes, he explores and synthesizes concepts found in eastern philosophy, management theory and the social sciences to arrive at useful insights and unlock potential. Goswami is a graduate of Stanford University. Here, he studied an eclectic array of disciplines including economics, history and computer science. After graduating he co-founded his own software company along with Bruce Krysiak, before creating the Bootstrap Network.